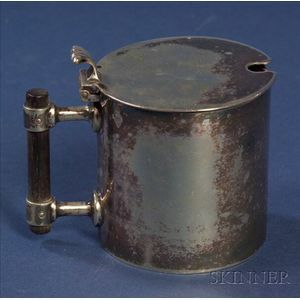 Christopher Dresser Electroplated Jam Pot, fourth quarter 19th century, Hukin & Heath, makers, retailed by Martin & Co., Cheltenham, cylindrical, with stylized shell-form thumbpiece on the flat lid, with ebony handle set parallel to the body, with cobalt glass liner, ht. 2 3/4 in., approx. 4 troy oz.